Hoover Floormate Deluxe Review: The Hard Floor Cleaner or Not? Cleaning a single room can be a tiresome, if not nasty task, but cleaning an entire living space usually ends in procrastination, right? People want to stay on good terms with personal hygiene, so even though we hate it, we still take up this chore. However, what if there were means to simplify it, and even make it fun and somewhat enjoyable? Certain brands like Hoover are well aware of the fact that virtually no one enjoys cleaning, so they went a step ahead with the Floormate – they’ve invented a contraption that would serve as a buddy, a companion of sorts who would help you with this gruesome task. 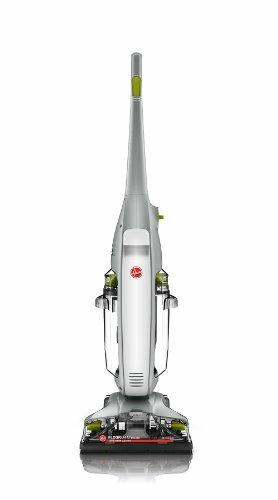 In our Hoover Floormate deluxe review we’ve decided to share everything that we can about this exceptional cleaner. Who is it good for, what features and technologies are on-board, what is there to like and dislike, and ultimately, is it worth the money? You can find out everything related to the topic in the sections below. The SpinScrub Brushes are among the most important features of Hoover Floormate Deluxe hard floor cleaner. They make sure that the floor is scrubbed from all the grime without grazing or in any other way damaging the floor, carpet, vinyl, and similar materials. The wheels outfitted to Floormate are exquisitely soft and gentle, which plays a key role for the hand fatigue problems. Namely, one of the main reasons why Floormate is so easy to use is because of the wheels being so tender. Every cleaning process is, in truth, messy. The filthy bits and pieces (after the cleaning process) have to go somewhere, and usually that place is the cleaner’s tank. Now, Hoover’s Floormate features two tanks, which means that each plays a different role. One tank stores clean water and uses it to clean the ground while the other one stores dirty water (along with the specks of grime). This technology isn’t particularly useful without the wash/dry modes. The wash mode uses the clean water while the dry mode refers to the traditional scrubbing technique. Some stains are incredibly hard to clean, even if you put your back into it. That’s where clean boost control comes into play. Namely, this feature allows you to muster out extra detergent to the stains (and other areas that deserve additional cleaning) by simply clicking on it. This comes particularly in handy when cleaning out the entire house and neglected areas such as basements or cellars. One of the main reasons why most people don’t particularly enjoy cleaning their homes is because it tires us out (apart from the process being boring on its own). Using Hoover’s Floormate, however, will lead you to a different conclusion. This cleaner is very easy to carry or lift because it weighs only 14 pounds. What’s more important is the fact that it’s easy to use – both your arms and your back will suffer from a reduced level of fatigue. Q: What’s the difference between “Floormate” and “Floormate Deluxe”? A: Apart from the obvious that Floormate Deluxe is an improved version of the former, it weighs less, it’s larger, and it was specifically designed for use on sealed hardwood floors, tile, and grout. Furthermore, the initial technologies (SpinScrub, CleanBoost) were re-tested and improved as well. Q: Is Floormate Deluxe usable on wooden floors that aren’t sealed? A: In all truth, any type of flooring that can be cleaned with a damp mop can be efficiently cleaned with Hoover’s Floormate Deluxe. Even though it was specifically designed for the purpose of cleaning sealed hardwood floors, it can be used to clean other types of floors just as efficiently. Q: How efficient is Hoover Floormate Deluxe on Laminate Floors? A: Laminate requires soft wheels which, fortunately, come outfitted to the Floormate Deluxe. Q: Is Floormate a “steam-powered” cleaner? A: Floormate isn’t steam-powered. It features two compartments – one holds the mixture of hot water and cleaning solution/solutions while the other one stores dirty water. Q: What cleaning solutions should I use with Floormate Deluxe? A: It would be best if you used the Hoover Cleaning Solution, as the technicians who devised it made sure it was an all-purpose cleaning solution. Alternatively, you could use any cleaning solution you deem appropriate at the risk of damaging your floors (or the Floormate Deluxe), although this is advisable only if you’re completely out of other options. Hoover’s Floormate Deluxe certainly lives up to its name. It’s one of the best (as well as one of the healthiest-to-use) cleaners you could find on the market. Additionally, it has a moderate price point, so there is no reason why you shouldn’t consider it. Surely enough, it can be noisy at times, and the motor could’ve “suffered” an improvement or two, but the general set of features that this cleaner comes supplied with is top-notch, to say the very least. Hoover’s Floormate Deluxe works effectively on all kinds of wooden surfaces, its Dual Tank technology ensures that your dirty and clean water don’t mix, and there are plenty of convenience features that simplify the ever-so-boring cleaning process. As a final verdict of Hoover Floormate Deluxe Review, it’s safe to say that Hoover’s Floormate Deluxe is well worth the money. Can it be used on cork flooring?